The release date for the trade paperback of Farnsworth's Revenge seems so far away - April Fool's Day next year. The first of Rollo's misadventures, My Inflatable Friend, came out on the same date, 2007. But especially if you read that one and its sequel Rubber Babes, you'll want to know how the trilogy gets resolved (and it does, with a wrenching twist, of course). The Kindle edition of My Inflatable Friend is now .99 on Amazon for a limited time. The Goodreads contest ends the week before Christmas, and the twenty winners should have their books by New Year's. Winners are encouraged to write and post reviews, and inclusion of spoilers will be a matter of personal conscience. 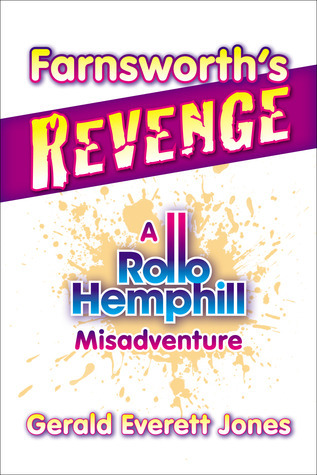 "Seeing poor Rollo go splat, it hurts so good when I laugh," Tom Blake, Orange County Register. Farnsworth's Revenge has a fair amount of backstory, so you don't necessarily need to read the books in order. But then, if you're a binge watcher of Entourage or House of Cards, you'll want to begin at the beginning, with My Inflatable Friend, in which Rollo's outlandish schemes first take (bodily) form. And then you'll be curious to know how Rollo manages to fail continually upward in Rubber Babes.